Jill Selinger give us tips for shopping at A Bloomin’ Festival coming to the Chicago Botanic Garden May 14-16, 2010. This year, you can shop not only for a wide variety of the best plants to grow in the Chicago area, but also fresh food, baked goods, and garden tools, all while listening to live music! 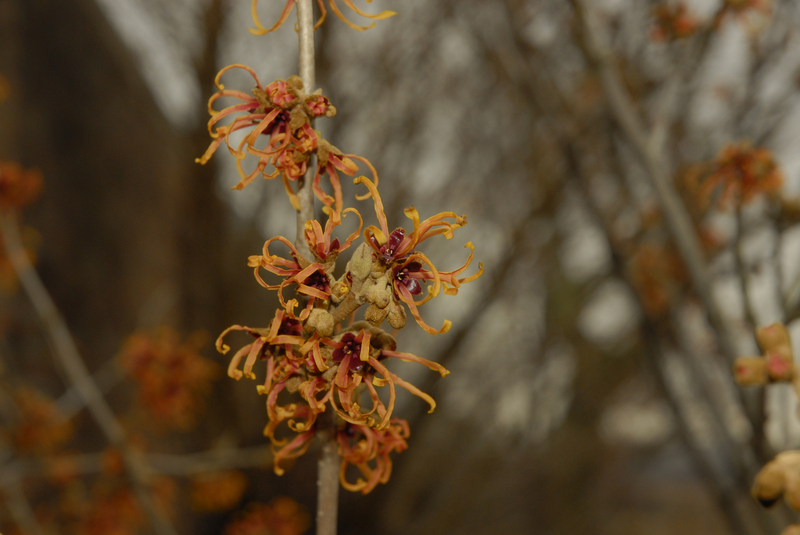 The Chicago Botanic Garden is showing the first signs of spring this week with the witch hazels coming into bloom. While these shrubs can be showy in three seasons, certainly their fragrant flowers that bloom at unusual times are of primary interest. They can be the latest (October) or earliest (February to March) shrubs to bloom, with their blossoms emerging while the brown seed capsules from the previous year are still attached to the branches. Hamamelis x intermedia ‘Jelena’ has flowers in an unusual blend of red, yellow and orange. Most other witch hazels have yellow blooms. Come out and enjoy this first sign of spring at the Garden!